UPDATE: We have delivered the contributions that you have dropped off at ARTA to Edmonton’s Food Bank. With your help, 64kg of non-perishable food items were donated to the cause. Thank you for your generosity and your spirit of giving. As you head into the holiday season, Edmonton’s Food Bank is preparing for their busiest time of year as well. This year there is an increased demand for donations; over 20,000 people are fed each month at the food bank and there’s always an increase in demand in December. 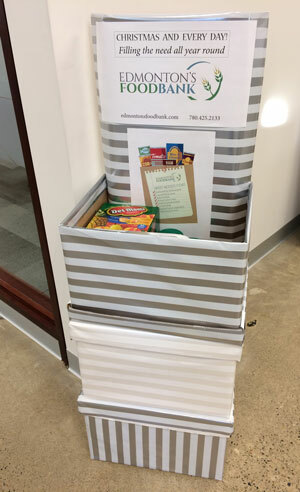 We at ARTA have set up a donation box in our office, so if you are in the area and would like to drop off a non-perishable food item, we are happy to collect them and deliver them to Edmonton’s Food Bank.